Haomei supplies embossed aluminium plates of various patterns, including 1 bar, 2 bar, 3 bar, 5 bar etc. Here we will give a simple introduction to properties of aluminium cheaquered plate 5 bar. Also known as willow leaf embossed aluminum, the aluminium cheaquered plate 5 bar is applied extensively in construction of floors and platforms because of its extraordinary anti-skid performance. The patterns of 5 bar on the plate surface are arranged in a relatively parallel manner according to the five concave and convex patterns, and each pattern exhibits an angle of 60-80 degrees with other patterns, which creates an excellent anti-slip effect. 5 bar embossed aluminum coil is usually used for preventing slip in China. In comparison to aluminum cheaquered plates of other patterns, the aluminium cheaquered plate 5 bar displays stronger anti-slip ability, used extensively in public tread plates and transportation vehicles. Based on the length of patterns, there are big and small 5-bar aluminum tread plates. The big bar is 42mm long and the small 34mm. 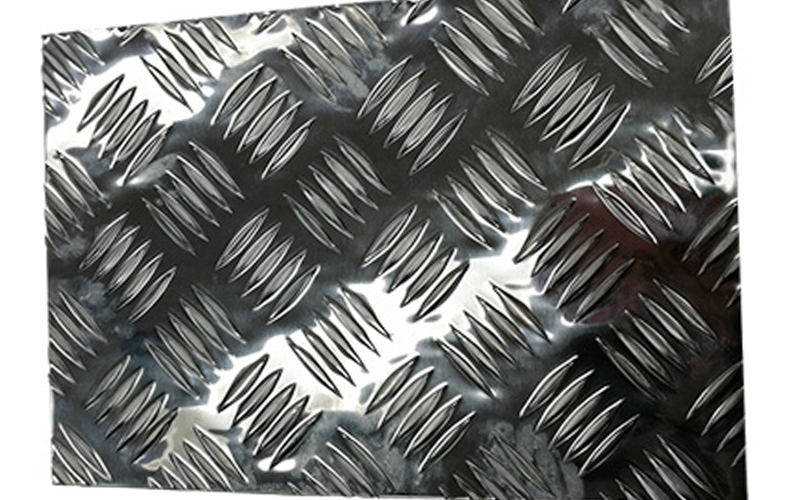 Different patterns of embossed aluminium plates correspond to varied application fields. For example, diamond aluminum plate is used for exterior packaging and pipeline wrapping rather than flooring. In addition, embossed aluminium plates of other patterns, like 3-bar, pebble and hammer, are used frequently in fridges, air conditioners, hanging beams, table feet, decorative strips and so on. The alloys for the aluminium cheaquered plate 5 bar are mainly 1 series, 3 series, and 5 series. The 1060 aluminum tread plate is cheaper than other alloys, suitable for common usages in cold storage, flooring and other similar environments. The 3000 series aluminum tread plate, represented by 3003, is also a kind of rust-proof aluminum. Their strength is improved compared with the 1 series, but they are overshadowed in hardness and corrosion resistance by 5 series, generally used in trucks, cold storage, and the like. Represented by 5052 and 5083, 5000 series aluminum tread plates have good performance, high hardness, good rust resistance and corrosion resistance. Therefore, they can be used for high humidity and high environment such as ships and compartment lights.